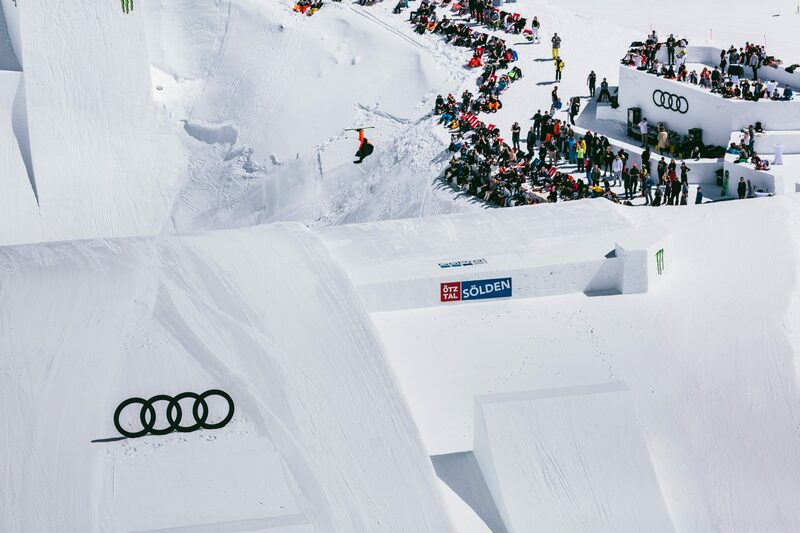 It’s a wrap: on Saturday the winners in seven categories were crowned at the Audi Nines presented by Falken in Sölden, Austria. 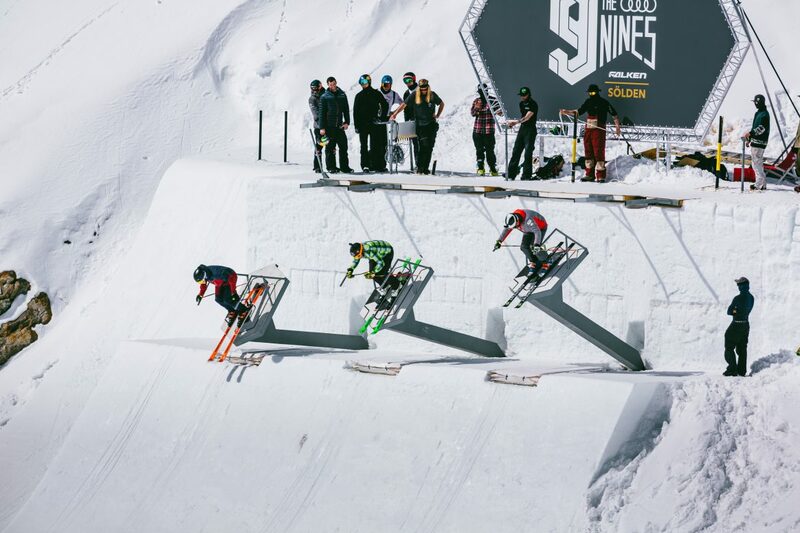 At the Public Contest Day, the male and female skiers and snowboarders showed thrilling performances on the new SlopeX course as well as Big Air and Quarterpipe. With the exciting set-up and perfect weather conditions drawing more than 3,000 spectators to Tiefenbach Glacier, the riders gave it their all and showed everyone they were eager to progress their sports. The athletes loved the unique combination of speed and creative obstacles. 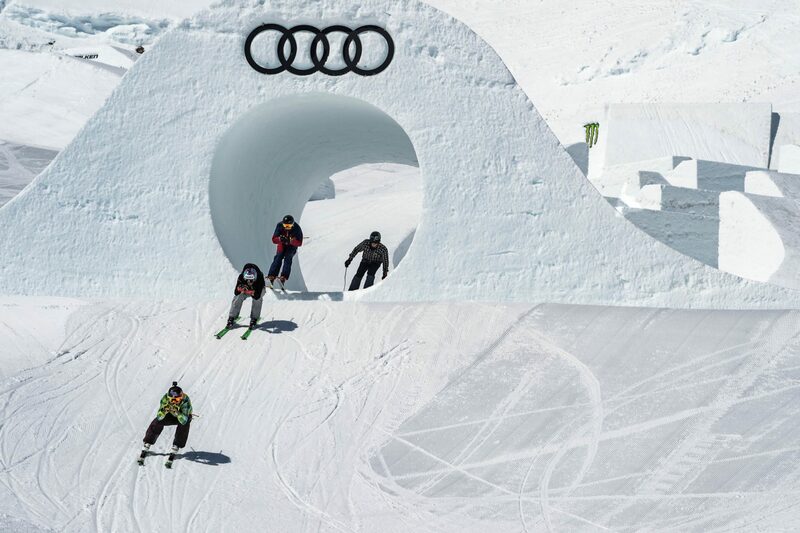 But also on a social level, the past six days at the Audi Nines brought Snow Cross and Slopestyle riders closer together. Mixing competitors from both disciplines created a whole new dynamic, as they brought their own interpretation of the SlopeX features and how to ride them. Closing a week full of exciting photo and film sessions, the Public Contest Day on the 14 of April 2018 will go down in history, not only for the unique approach of the organizers but also for the jaw-dropping skills the riders showed. The unique loop obstacle proved to be a highlight among the numerous innovative elements of the SlopeX course. For reigning Olympic Ski Cross Champion Brady Leman (CAN), a dream came true: “Since I was a kid, I always wanted to ski a loop!” The obstacle also presented an opportunity for Jesper Tjäder (SWE) to do the first ever switch loop on skis and Gigi Rüf (AUT) to show possibly the first ever carved snowboard loop. 2015 World Slopestyle Champion Fabian Bösch (SUI) created a buzz on social media with his ridiculous Triple Frontflip Superman over the Middle Jump, while riders and spectators alike loved the spectacular new “Hammer Drop Start”. The Public Contest Day began with the SlopeX qualification in the morning, then the fastest riders competed in eagerly awaited finals in the afternoon. For the snowboarders’, 2-time World Snowboard Cross Champion Alex Pullin (AUS) prevailed over 2-time Olympic Champion Pierre Vaultier (FRA) and snowboard legend Terje Haakonsen (NOR). Among the skiers, Olympic Ski Cross Champion Brady Leman (CAN) won by a hair’s breadth ahead of Alex Fiva (SUI) followed by Tim Hronek (GER). Additionally, Pierre Vaultier, Brady Leman, Christian Haller (SUI) and Jesper Tjäder (SWE) took the win in the new SlopeX team competition. The freestyle Big Air competition took place on the Main Big Air feature offering three different take-offs. The finals were held as a 70-minute jam session with the two best tricks counting. On the skiers’ side, trick wizard Andri Ragettli (SUI) convinced the judges with his Switch Triple Cork 1440 Safety and Triple Cork 1620 Double Safety, leaving James Woods (GBR, Triple Cork 1440 Safety & Switch Triple Cork 1440 Octo) and Ralph Welponer (ITA, Switch Double Cork 1440 Blunt & Triple Cork 1620 Safety) in second and third respectively. For the snowboarders’, local hero Clemens Millauer (AUT) took victory landing a Frontside Double Cork 1440 Tailgrab and a Switch Backside 1260 Melon. Second place went to Carlos Garcia Knight (NZL, Frontside Double Cork 1080 Nosegrab & Switch Double Cork 900 Tailgrab). 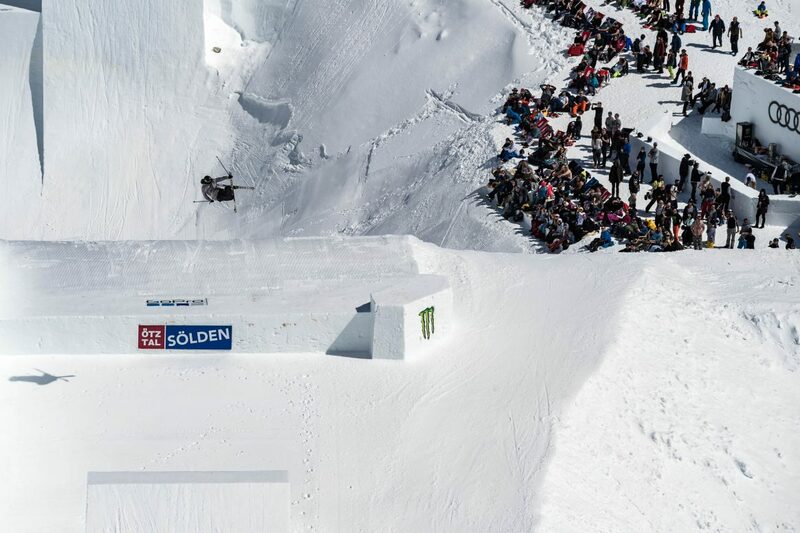 Simon Gruber (ITA) took third performing a Frontside 1080 Indy and Backside 1080 Mute. Terje Haakonsen also took the quarter-pipe Best Trick Award with a classy and massive Backside Air. Olympic Slopestyle Gold medallist Sarah Höfflin (SUI) dominated the female skiers’ competition sticking a Switch left side Double Cork 900 Safety and Switch Double Cork 1080 Mute. Second place went to Jennie-Lee Burmansson (SWE), while Darian Stevens (USA) took third. For the snowboard women, 2017 Aspen X Games winner Hailey Langland (USA) earned the win with a Cab 720 Nosegrab and one of the biggest Cab 1080s ever stuck by a snowboarder. Klaudia Medlova (SVK) took second while Silje Norendal (NOR) and Sina Candrian (SUI) tied for third. The Public Contest Day was a perfect ending to an exciting week at the Audi Nines presented by Falken. The thrilling footage produced in Sölden during the previous days proves the event has taken these sports to a new level. Find out more on www.audinines.com !